I want to create a block on the side of the page that will show registered users to a event. I already have a event type and calendar system + a registration system. When a user registers for a event, I can get the view to display it. However, it is displaying literally ALL registration users for ALL events. I am trying to get the contextual filter to just narrow it down to the specific event, but cannot get it to work. You don't use contextual filter for this, you need to use relationship. Make sure the Registration Views module is enabled. Checkmark your registration type name. 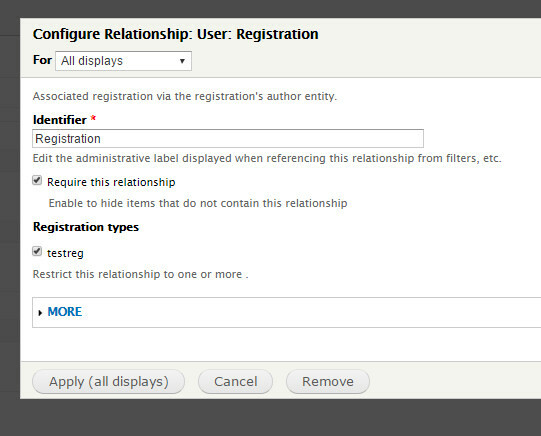 Using Entity Registration, how can I create a view that shows all the events that a user has NOT registered for? Im using entityforms to make events on a Calendar. How can i prevent duplicated dates?